I was planning to hold off on sowing any seeds until after my trip to the UK in April. Not that I don't trust Mike to take care of them (honestly! ), but I just thought it might make things easier all round. 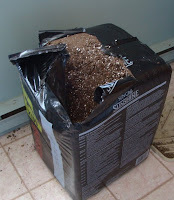 Plus I didn't have any potting compost, which does rather constrain that kind of activity. And I wasn't sure if my UK-purchased propagator was going to work here. While the kids were at their swimming lesson we did the usual mad dash round the library and supermarket in Picton, followed by a trip to a garden centre. This is a small business, comprising three or four polytunnels and a small barn which houses the shop. The shop had a sign by the till saying "We're in the greenhouse, come and find us!". This is fairly common for businesses here, which are often small family concerns run out of the owners' homes. This style of doing business took us a bit of getting used to - there isn't always an obvious 'shop front' to go to, for example. I used to spend ages of indecision looking at all the different types of compost when I bought it from garden centres in the UK - peat free? multipurpose? sowing and cutting? brand or own brand? moisture-retaining or not? So it was quite refreshing at this establishment to be offered the choice of either a 10 litre bag or a 107 litre bale. And that was it. So I plumped for the bale (Mike was with me to carry it, luckily (or maybe not, from his point of view)). ...more than 270,000,000 acres, 25% of the world's supply, of which our industry harvests on less than 40,000 acres, or one acre in 6,000. According to the Canadian Sphagnum Peat Moss Association, anyway. They harvest the stuff, so they might be just a teensy bit biased. Not sure now whether I should be feeling guilty or not. Maybe I should make myself a hair shirt out of sphagnum moss to be on the safe side. Anyway, we hooked the propagator up to one of the voltage regulators we had to buy to save getting all new electrical appliances, so that works fine. Now I couldn't resist starting some seeds. What did I sow, you may or may not be asking. Red tomatoes in this batch - Riesentraube (an heirloom grape-style) and Amish Paste (another heirloom plant, ideal for tomato sauces). I think of the propagator as an incubator or intensive care unit, so once they're up I'll replace them with peppers, chillies or aubergines and get a little production line going. Ha! I'm enjoying your style and what a challenge to start growing crops in another country. I'm itching to get everything started right now but I bet you have to hold yourself back for even longer. Still, I bet you have more land in Canada, they seem to be big on land.